Collecting Spider-Man (2016) #12-14, Spider-Gwen (2015B) #16-18. K-I-S-S-I-N-G! That's just one of the things that makes this a very modern Marvel team-up, as the two most sensational web-spinners of the 21st century cross paths — and lock lips! 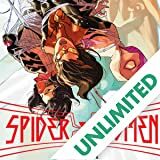 Miles Morales and Gwen Stacy are two young heroes from different Earths, but what threat could unite the Spider-Man and Spider-Woman of the new generation? The answer will rock both their worlds! 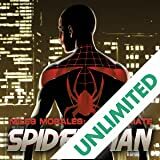 Not for the first time, Miles will find himself in another universe — and he's in pursuit of someone he holds dear. 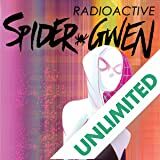 But will that description soon apply to Gwen? Or, as the stakes are raised, will this spider-crossed pair see teen romance give way to arachnid animosity? First comes love, then comes much worse, then comes chaos in the Multiverse! 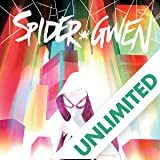 Spider-Gwen spins into her own series! Gwen Stacy is Spider-Woman, but you knew that already. What you don’t know is which friends and foes are waiting for her in the aftermath of Spider-Verse!